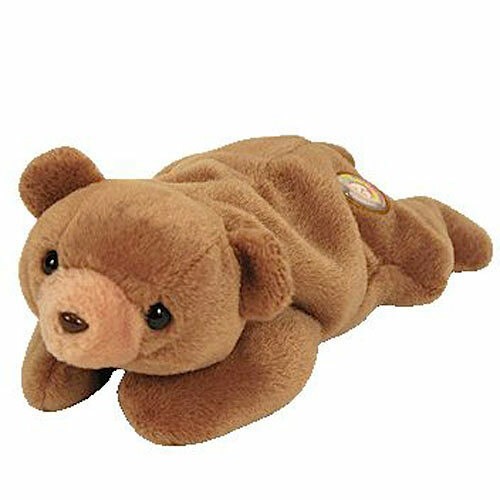 Cubbie is a medium brown coloured bear with a lighter brown muzzle. He has black button eyes and a brown button nose. He has a BBOC badge on his left side. Now Cubbie eats broccoli and cheese! Cubbie was introduced 3rd October 2005. This is the Beanie Baby Official Club (BBOC) version of Cubbie. There are BBOC versions of all the original nine. BBOC members could purchase replicas of the original nine Beanie Babies. There were five different assortments each with nine Beanie Babies. Each assortment was given out at random so the member buying it didn’t know which assortment they would receive. Each assortment contained one special version of one of the original nine Beanie Babies. Chocolate, Flash, Legs, Splash, Squealer, Pinchers, Spot with a spot, light pink Patti and either Cubbie or the rare Brownie. Chocolate, Flash, Legs, Splash, Squealer, Pinchers, Cubbie, Spot with a spot and the light pink Patti or the rare deep fuchsia Patti. Chocolate, Flash, Legs, Splash, Squealer, Cubbie, Spot with a spot, light pink Patti and Pinchers or the rare Punchers. Chocolate, Flash, Legs, Splash, Squealer, Pinchers, Cubbie, Spot with a spot and the light pink Patti or the rare raspberry Patti. Chocolate, Flash, Legs, Splash, Squealer, Pinchers, Cubbie, light pink Patti and Spot with a spot, or the rare Spot without a spot. The BBOC version of Cubbie retired on 9th March 2006.